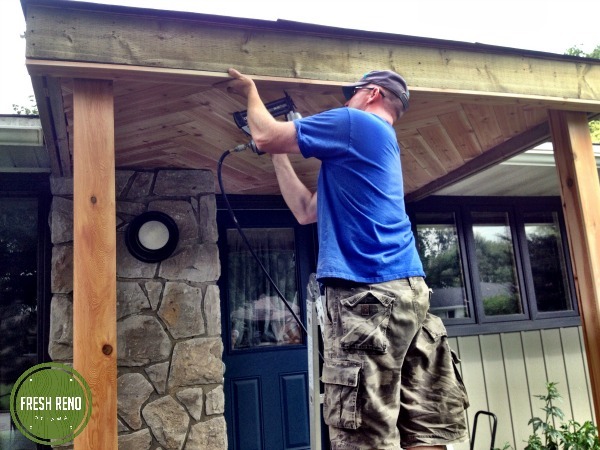 Back in the spring, Don and I blocked off a few weeks in the summer to help each other with projects in our own homes. 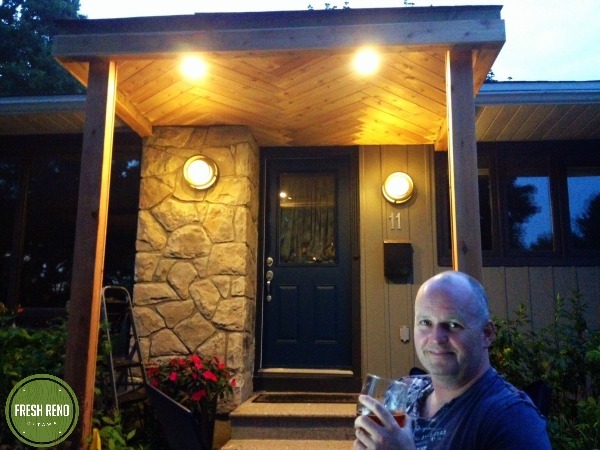 We finished Don’s basement, did the roof at Heather’s and my place, and I built a porch. In case any remembers the porch I built at my previous home a few years back (if so, good memory! 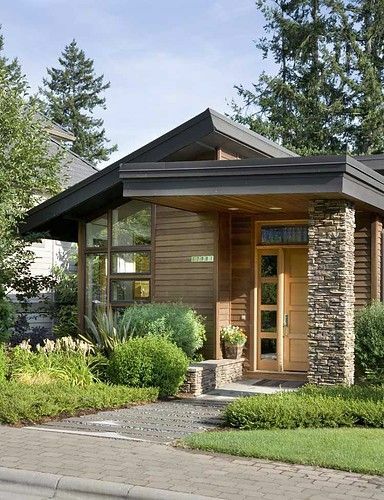 ), you’ll notice this porch has a completely different vibe. While our house was build in 1965, we like the mid-century vibe and admire the flat roof porches from that era, which are also on many new homes these days. Heather pulled together a Pinterest album full of inspiration, including the image below. Inspiration photo for the porch. After contacting One Call for all utilities to mark services to the house, we knew precisely where the gas line runs. The gas line was our biggest concern given that it’s directly to the left of the front door. We’d originally contemplated moving the gas metre, but discovered Enbridge would charge $4,000 and it’s only Enbridge that can move it. Option B is to leave a 6″ clearance around the gas metre when the new front step goes in. Until this summer, you’d need to hire a company to drive in steel helical support posts for decks and porches—$800 each. This year, both Rona and Home Depot started selling Pylex adjustable foundation screws that you can drive in yourself, at a cost of only $24 each. Day 1: Driving in 60″ Pylex adjustable foundation screws (from Rona, $24) by hand. 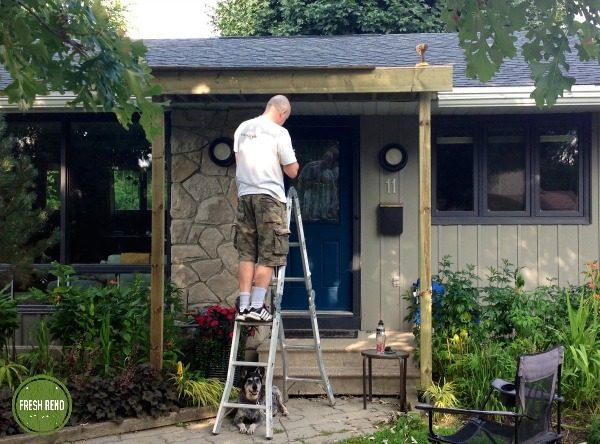 Day 1: Framing the flat roof porch, with Yoda, my trusty old girl. 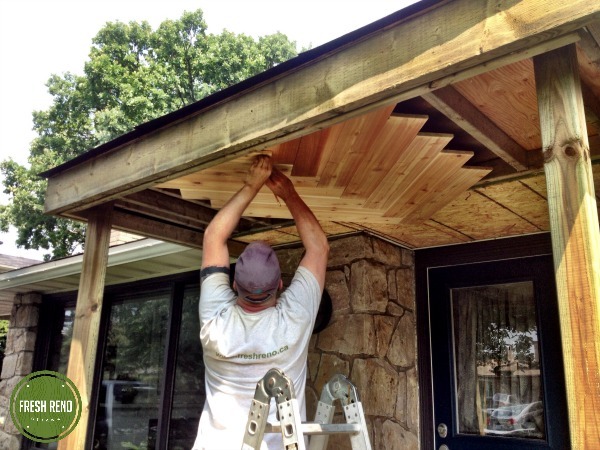 Day 2: Cladding the porch ceiling in cedar. We were originally going to lay the planks in rows, but decided to go with a herringbone pattern instead. 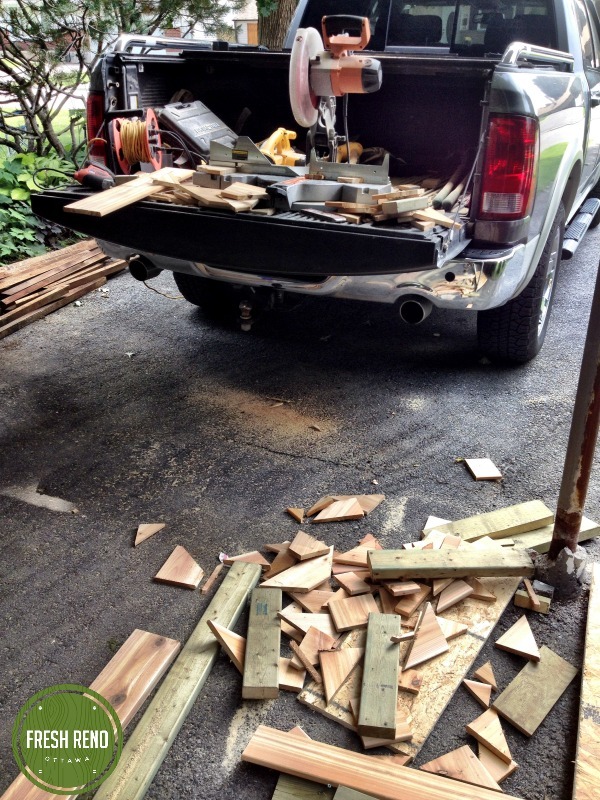 Day 2: working out of the back of my truck. The herringbone pattern adds considerable time, but looks amazing. Day 3: Herringbone done. Now cladding the posts and roof sides in cedar. Painting vs. staining discussion so far: clear coat the herringbone and paint all other wood the same dark grey as the window trim. 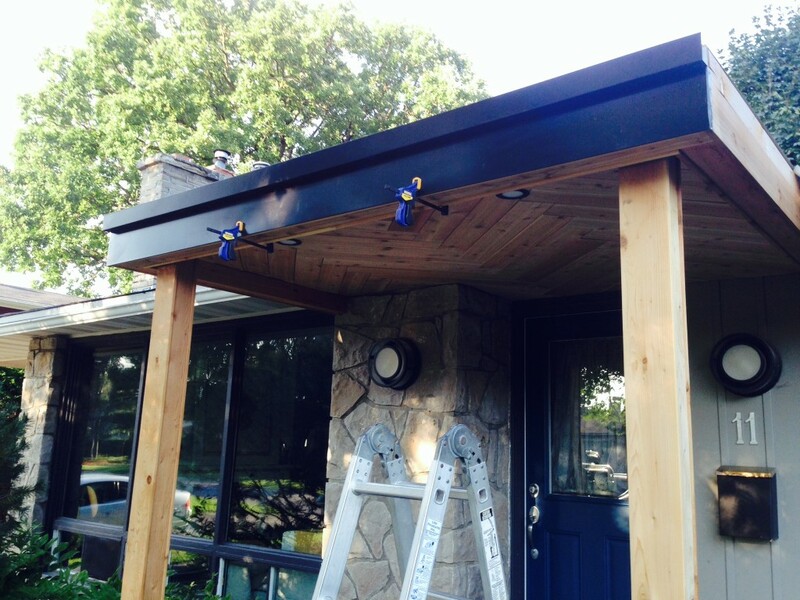 A few weeks later: The roof has a 5-degree slope and I ordered a custom roof to include an eavestrough. The custom room was a surprisingly inexpensive $180. Heather and I are really happy about having this additional space to sit under. Stay tuned… more updates to come.